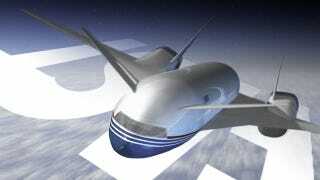 Boeing's Sonic Cruiser began its life almost a decade ago. At the end, its superawesome supersonic design was replaced by the 787 Dreamliner's superboring superquiet and superefficient blueprint, which started construction in 2007. Many thought the project was cancelled, but apparently a secret team of Boeing engineers is still working on it. According to Stephen Trimble, the new Sonic Cruiser appeared in a patent published on April 19. It has a lot of changes: the engines are not embedded in the wings—a la Concorde—but placed over the wings, which also have vertical stabilizers. The engine would also have variable geometry chevrons, like the F-35. I would really like to see a 3D rendering of this new version (the one above is the old one).